You’ve been asking for it and now we’re making it for you. 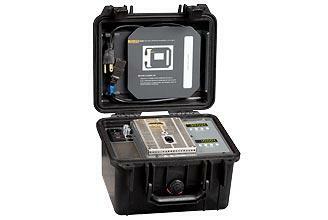 The Model 9009 Industrial Dual-Block Calibrator lets you calibrate at hot and cold temperatures at the same time. Double your productivity or cut your calibration time in half—either way you look at it, your in-field temperature calibrations just got easier. The Fluke Model 9009 (formerly Hart Scientific) includes two independently controlled temperature blocks. The hot block provides temperatures from 50°C to 350°C, while the cold block covers the range –15°C to 110°C. Each block is controlled by a precision Fluke Calibration temperature controller. These aren’t some off-the-shelf controllers we glued into a box. These are Fluke Calibration controllers from the leading temperature company in the world. Each temperature block includes two wells with removable inserts. You can calibrate four probes at once, or you can calibrate two probes at the same time with an external reference like Fluke Calibration's Model 1523 Reference Thermometer, or you can use the two temperature wells to get quick “zero" and “span" references for transmitter calibrations. Need portability and durability? 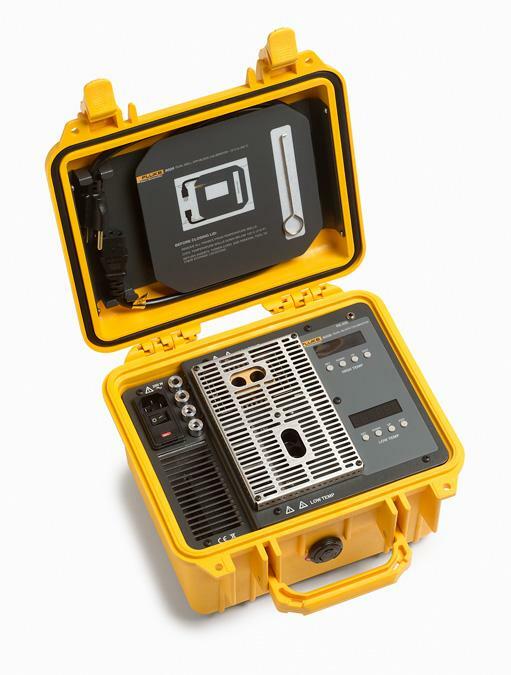 The 9009 is housed in a tough Pelican™ case that is both airtight and watertight. It’s a small package weighing only 10 pounds, yet it fits everything you need, including a power cord and four extra inserts. Inserts are available to accommodate sensors of any size from 1/16" (1.6 mm) to 7/16" (11.1 mm). 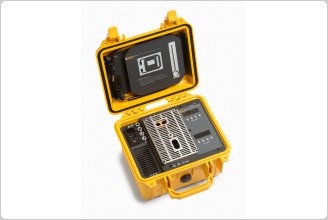 This rugged system can go anywhere. Of course the 9009 also delivers the performance you expect from a Fluke Calibration temperature source. The cold block is calibrated to within ±0.2°C with stability of ±0.05°C. The hot block’s display is accurate to ±0.6°C with stability of ±0.05°C. A NIST-traceable calibration is included for each of the two test blocks. For use with automated systems, the 9009 comes with an RS-232 connection and our Model 9930 Interface-it software, which allows you to control and monitor temperatures from your PC. For completely automated calibrations, Fluke Calibration's MET/TEMP II software also integrates with the 9009. Two blocks in one unit, a total range of –15°C to 350°C, portability, durability, versatility, performance, automation. Fluke Calibration delivers it all. Industrial Dual-Block Dry-Well (X = case color. Specify “B” for black or “Y” for yellow.) Includes two 1/4 in (6.4 mm) and two 3/16 in (4.8 mm) inserts. Insert, AL 1/2" X 4" 1/16"
Insert, AL 1/2" X 4" 1/8"
Insert, AL 1/2" X 4" 3/16"
Insert, AL 1/2" X 4" 1/4"
Insert, AL 1/2" X 4" 5/16"
Insert, AL 1/2" X 4" 3/8"
Insert, AL 1/2" X 4" 7/16"
Insert, AL 1/2" X 4" 5/32"